master bedroom has a king size bed with flat screen tv with cable, dvd and internet tv. full bathroom is adjacent to the bedroom. loft has twin bunk bed and queen bed with flat screen tv with cable and dvd. the loft has its own full bathroom. condo has washer and dryer for your convenience. european styled kitchen is fully equipped for cooking a gourmet meal if that's what you are into. cookbooks are provided if you feel inspired. wildflower is a lovely condominium complex located in town. it is beautifully landscaped with lots of grassy areas, flowers and tall pine trees. the swimming pool and tennis court is open in the summer and the hot tub and sauna are open year round. Keywords: this thoughtfully renovated 1 bedroom/loft + 2 full baths in wildflower condominiums is located in the town of mammoth lakes. it is located within walking distance to great restaurants and across the street from the green shuttle line that takes you to eagle lodge. it is 1 block away from the red shuttle line that takes you to the village or main lodge. the condo sleeps 6 people with all beds occupied. the condo is beautifully decorated with contemporary modern furnishings. the european style kitchen is fully equipped for cooking. the living room has a beautiful fireplace, fully stocked with firewood to keep the place nice and warm. there are 3 flat screen's with cable, blue-ray, dvd, and internet tv for netflix streaming. red shuttle line is 1 1/2 blocks away (5 minute walk) which takes you to the village for gondola ride to canyon lodge or you can continue on to the main lodge. Mammoth Lakes Area has an abundant amount of hiking trails, mountain bike trails, lakes for boating and fishing, horseback riding and summer festivals. There are countless activities to keep one busy throughout the summer. The weather is amazing and the scenery is stunning. The eastern entrance to Yosemite National Park at Tioga Pass (Hwy 120) is an easy 30-minute drive north of Mammoth on Highway 395. Travel time from Mammoth Lakes to the Yosemite Valley is approximately 2 hours. Please note - Tioga Pass is open in summer months only. **no early check ins or late check outs without written approval and is subject to an additional fee. i am a set decorator living in los angeles and love the fresh mountain air and the lifestyle of mammoth. in the winter, i am a holiday snowboard instructor on the mountain. wildflower is a well run condo complex and i love the proximity to restaurants and shopping areas. it is close to the shuttles so one does not need a car to get to the mountain. flying into mammoth is an awesome option instead of driving. i started coming to mammoth in the winter for the abundance of snow but the summers are truly special. the eastern sierras have so much to offer in the summer like hiking, fishing, rock climbing, mountain biking, music festivals and food and wine festivals. Cozy, comfortable, beautifully decorated and a very easy walk to the shuttle stop to the lifts. The best-stocked kitchen I’ve ever used in a rental. The kids loved the loft. Would definitely stay again. We always stay here whenever we visit Mammoth. 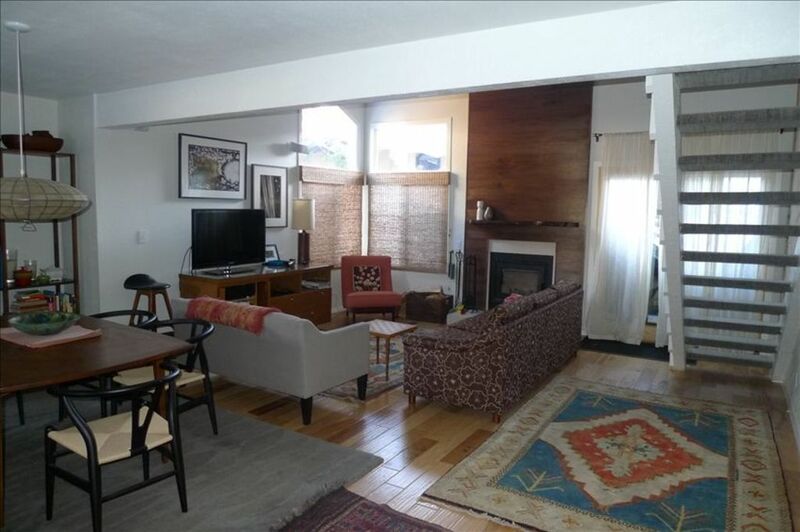 It is very spacious (loft was perfect for the kids) and conveniently located in town. The owner has thought of everything to make it functional (abundant storage, organized, labels & instructions for everything). The kitchen has everything I needed so it streamlines my packing & shopping. I also love the eclectic, mid-modern vibe throughout. The owner is very easy to work with and gave us good suggestions for areas to explore with the kids. This was a great spot located on the shuttle line but more importantly this unit is very well appointed by the owner. She was very responsive and communicated really well with us. We will stay here again for sure. All of the appliances were high-end, the kitchen was set up for some serious cooking. We used the Jacuzzi every night which was welcomed after long days of skiing. Owner was very communicative with us, and made our stay very pleasant. Such a great place to stay. Kitchen has all you could want and more. Spacious, clean, location and quiet. Gail was the perfect host - responsive and very professional. Wifi was fast!! Parking right outside your door. If you are looking to enjoy a home away from home this is the place. YOU WONT BE DISAPPOINTED. Clean, modern and absolutely everything you need. Would definitely stay there again!